Finished this one up today and I am happy with the outcome. I will never get tired of seeing little kids lead horses around. My great nephew is learning the ropes from one of best. Our good old red barn provides a colorful background to this iconic scene. This is my own good horse Merllin in his sunny stable waiting for us to go riding. Had a lot of fun working on the colors of the horses, particularly on the unridden horse- adding blues and different reds and oranges. This scene was taken from one of the millions of photos I take annually when I go to the Rolex Three Day Event in Lexington, KY and also visit Keeneland Race Course in April. This is a morning workout at Keeneland and this horse is being ponied around the track, perhaps because he has so much energy in his step. Because none of his feet are touching the ground, all the extra energy and the time of year this one is titled "Spring". I took this off the watercolor block just as the last words were read in the audio book "As you Wish" by Cary Elwes. I must have been subliminally working with that in mind. The book was a great listen; it took me back through the movie and behind the scenes and made me love the movie even more. This painting is based on a photo I took at Richland Horse Trials in 2015 and it is of Buck Davidson, an iconic rider in the 3-Day Eventing world. I loved the power of the big red horse and the bright highlights. I also love the cross country course at Richland Park- it winds through woods and fields and gives a nice backdrop to the action. I painted this image because I was drawn to the green grass coming into the woods and the subtle shift in colors. Also the mist of the day melting the trees into the far background. It is successful in those ways, but I probably could have left the horse out if that was all I wanted to do. Well, horrors, what's a landscape painting without a horse in it! This painting has been juried into the American Academy of Equine Artists 2016 Fall Open Show and will be on display in Georgetown, KY starting in Sept.
Cross country is my favorite phase of 3-Day Eventing. I am fortunate that there is a world class course, Richland Park, established very near my home and every year I can see Olympic riders take to the field. This particular turn appeals to me as a trail rider (going cross country in my dreams). Richland Park is a lovely setting for Eventing and attracts more and more riders every year. 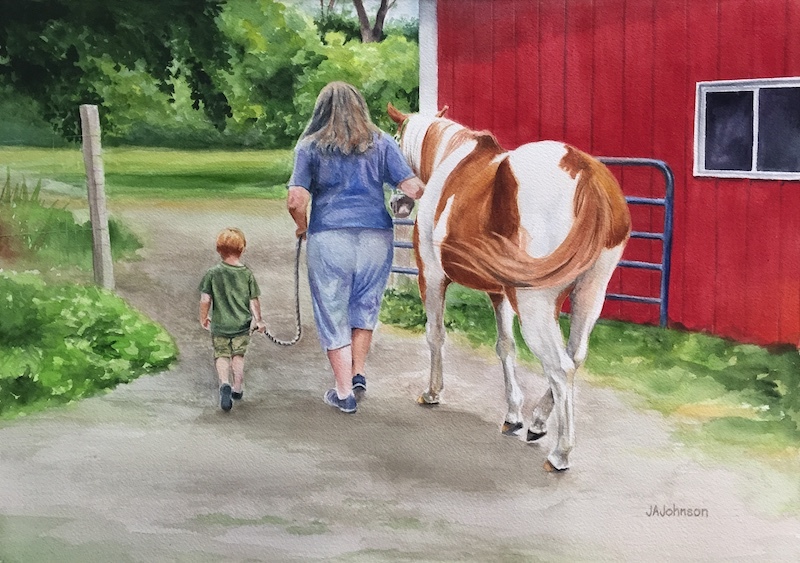 The painting is titled "Placed" as this horse came in second and is being walked back to the barn while the winner gets his picture taken in the Winners Circle. On the sidelines of a horse show a girl and her horse pause for a quiet moment while watching the competition. The source for this painting was a photo taken when a friend and I visited Shipsawana, Amish country near our home. It was early summer and most of the field work had been done so the draft horses were taking advantage of the pastures and the time off. This was taken on the same day as #2. I feel that the interactions between pairs of draft horses remind me of couples I know, hence the titles. Perhaps because they are tied together in harness for much of their lives it seems an apt comparision, and I mean that in the working together sense of tied to each other, although you may interpret it for yourself. I have been fortunate enough to be able to share my love of horses with young friends through the years. We are all full of dreams about our steeds and where they may take us. This is our mare, Missy, who helped a lot of young girls' dreams come true, and boys- I am reminded by my nephew. While in Ireland one spring, I saw this pretty white pony in a vast sea of green. I later learned he belonged to the cook of the inn where we stayed and she had rescued him from a sorry state. I painted him looking at a break in the treeline and a possible "escape" to a new pasture. Titled after a Steve Winwood song, it applies to both the pony and his rescuer. While she has always been surrounded by horses this is the first one she had owned and she was taking a chance, too. This little guy went home today. The client picked him up and was overjoyed. It makes me so happy to do these portraits and to have them well received. I think this is one of my best so far, too. Good old George. There was a snow day today which allowed me some extra time today to finish this commission of two Chugs in plenty of time for them to dry and be delivered! Though not a fan of "floating head" portraiture, I am happy with how these came out. This was another "Rolex dog," and one I kept running into throughout the day. Each time he took my breath away he was so beautiful. This original 5x7 matted (8x10) watercolor is available for $60 plus $5 S&H. I am also offering 5x7 giclees for $10 plus $5 S&H. 20% of all proceeds will be donated to the Kalamazoo Animal Rescue, one of our local rescue organizations. I love dogs with different colored eyes. This husky was a rescue with the SPCA of SWMI and has long since found a home, but there are always great dogs waiting for homes. This was the winner of a raffle for a portrait that benefited the SPCA of SWMI. Moose was a rescue dog herself and after a rough start in life is now a beloved family pet. Last summer we visited some new friends in upstate New York and spent the night with them. There was a full moon that night and as we watched it rise over their old barn and home we played in the rolling hayfields throwing big sticks for the dog. Later we sat around a large bonfire under the light of the moon. It was a wonderful night spent in the easy company of new friends and one that I will never forget. I hope Riley's parents think it looks a little like him because they are stuck with this painting. I am particularly fond of his paw sticking out, it looks soft and paw like without too much detail. Kitty is the name of my niece's cat that shuffled between homes of college students until he ended up forever with my niece. You would think that college students would have come up with a better name, but oh, well. He is a super friendly and fluffy guy with a personality all his own. With some inspirational art direction from my biggest fan two little bees came into the picture. So here's the story behind the painting. My mother was in the hospital and it was Mother's Day so I decided to bring her some flowers. It seemed like a nice thing to do. But when I brought them in the room she told me it was inappropriate to bring them to the hospital because she would have to worry about bringing them home. Guess who has to bring her home with the flowers anyway. Sigh. When I was leaving the room at the end of the visit she told me I shouldn't be wearing the tights I had on -they were not flattering. Sigh again. I thought the flowers looked nice in the window and snapped a picture and it has been on my potential painting image list for awhile. Adding the two little stingers was the perfect addition and now I can let it bee. I have to post a disclaimer that my mom apologized later and felt terrible for criticizing me. I could cut her a giant amount of slack, she was in the hospital after all. Lately she is more and more dependent on my help and is always extremely grateful and gracious. My own daughter has and will have her own stories about me. Guess it's a mom thing. I was eager to get some painting done this morning so opted to do that instead of the million things I need to do outside. I am calling this one "An alternative arrangement" since we opted to stay at this bed and breakfast near Woodstock, NY instead of at the wedding venue where many others stayed for the Labor Day weekend. My biggest fan had flowers waiting for me when we checked in. Nothing is sweeter than a mother and her baby unless it is your own daughter and her newborn. This is a keeper for my own collection. We were visiting our 2 year old grandson when it was time to make Easter eggs and after they were done they were much loved and admired before they could be eaten. One of my largest oil paintings, this one measures 36x40. It is of a girl and her dog on the road- but is there another traveler or does the dog drink coffee? Where are they bound? My son took original photo and I just loved the lighting and the pose and had to paint it. This painting was juried into the Box Factory for the Arts in St. Joseph, MI in 2012 and won an Honorable Mention. This is also my entry in the Grand Rapids ArtPrize competition for 2013!!!! It will be displayed at The Lantern Coffee Bar and Lounge. I was attracted to the beautiful colors of the lures in my brother's new tackle box. So far all they have done is look pretty but that's enough for me. A watercolor portrait of my husband who supports me all the way, as my art work does not! This painting was recently juried into the West Michigan Area Show at the Kalamazoo Institute of Arts in Kalamazoo, MI. 150 pieces were selected from over 600 entries. I am so pleased to have made it into this prestigious show. The show will be up during April and May 2010. While visiting our daughter in Benin, Africa we visited a village where they made gravel- by hand. As we were leaving to climb a trail this boy captured a dove and ran to show me. I did not understand if it was a gift or a boy showing off his pet or dove catching skill or if he just wanted his picture taken but it was a beautiful image. And in that way, a gift. We visited my daughter in Benin, Africa, while she was serving in the Peace Corps. Every family member has their jobs to do, even the youngest. The reference for this was out her front door, and is Gee, maybe about 6 yr. old, doing the laundry. © 2019 Judith A Johnson all rights reserved. The material on this site may not be reproduced, distributed, transmitted or otherwise used, without the prior written consent of the owner.